Thank you for participating in the WYHA player evaluation. Our aim is to have an evaluation program that allows all players an equal opportunity to demonstrate their hockey skills and place them at a competitive level that is equal to their ability. The drills planned will afford your player every opportunity to do his/her best and to give the evaluators a clear picture of the skaters' abilities. Since evaluations can be stressful for both parents and players, we suggest that families prepare themselves for the event. A child will usually settle down after being on the ice for a short time, but because the sessions are limited the parents need to control their own stress and focus on helping their player(s) remain calm and ready to put their best effort forward. Please take time to read the following information and if you have any questions, please ask the House Director or Registrar. Please do not, in any case, approach the evaluators or on-ice staff during the session because we have limited time on the ice and these volunteers need to focus on their responsibilities. The Webster Youth Hockey Program strives to have an accurate and fair evaluation experience, we hope that players and families remember that no process is ever perfect. Our goal is ensure that all players are evaluated properly and placed on a team at that player’s abilities to help them develop properly. If you have any constructive input or opinions about our process, please share these with the House Director or any member of the WYHA Board. We strive to make the process the best that it can be and understand with feedback we can continue to improve. Also, please note that our volunteers make the evaluation experience happen and if you feel that you can help, please let the House Director know. 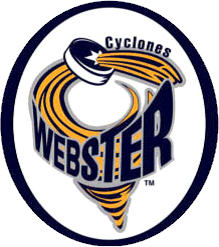 Thanks again for participating in the Webster Youth Hockey evaluations. We look forward to your continued support and participation through the coming hockey season. Players with Last Names starting with A-M should attend on Wed, 4/24. Players with Last Names starting with N-Z should attend on Thurs, 4/25. Please arrive at least 45 minutes prior to your evaluation time in order to complete the registration process (whether online or in person registration is chosen) and have your child assigned to an evaluation group at the Registration Table before the player proceeds to the dressing room. Your child can only be assigned to an evaluation group if you complete registration as described below. It is recommended (but not required) that your child wear a jersey with their name on it. If there is a conflict with your assigned date/time above, please email Jeanne Barreca, registrar@wyha.com, with a time on one of the 2 above dates that does work for your child - in most cases we can accommodate your request. Note the above dates & times are assigned so everyone does not show up at the same time (thus decreasing wait times for their group to be called) and to try to keep similar age groups in each evaluation group. Online Registration for Evaluations will open one week before the start of Evals. NOTE: Players who will be registering for the Beginner Program or the Pony/6U Team(s) should NOT attend Evaluations. Neither Program requires an Evaluation. ALL PLAYERS MUST STOP AT THE REGISTRATION DESK to be assigned to a Locker Room and Evaluation Group whether you registered online or plan to hand in your form and check/cash when your child arrives! If you pre-register online, the WYHA Evaluations Registration form is completed online and does not have to be filled out and brought the night of Evals. 2.) Fill out the WYHA Evlauations Registration Form and bring cash or a check (for $150) to Evaluations. A.) A copy of the ORIGINAL release (this may also be forwarded to the Registrar at registrar@wyha.com before tryouts begin if your organization emails releases). If your child does not have a Release, he/she will NOT be allowed to Evaluate! To Register & Pay by credit card ONLINE, click on the PROGRAMS tab, select "Evaluations Registration", read the info on the page, then click on the REGISTER button on the right hand side of the page and follow the prompts to complete the Registration and pay by credit card. Registration will open on 4/17! NOTE: A WYHA account must be established to register online! 1. Any player that owes money to WYHA or has not turned in borrowed uniforms or equipment is ineligible to tryout until paid in full and equipment is returned. 2. The Evaluation schedule is subject to frequent changes. Please check the website at www.wyha.com frequently to ensure that you do not miss a date or time. Coaching announcements will also be made via the website. 3. Checks for the $150 should be made out to “Webster Youth Hockey”. Please print your player's name in the memo field on any checks. 4. Full hockey equipment is REQUIRED for Evaluations. 5. Players who Tryout for Travel or Girls Teams will have the $150 transferred to Evaluations. These players should report to the Registration Desk and report they attended Travel or Girls Tryouts and they will be added to an Evaluation group and assigned to a Locker Room - no additional Registration or Fee is required! What are Evaluations? Evaluations are a simple way to see what a player's basic hockey skills are compared to their peers. This helps WYHA and its coaches place players on the appropriate team for their skill level. Evaluations are different than a travel try-out. In a travel try-out, players are competing to be placed on a team and certain skill levels are required to be selected for that team. Evaluations are not a try-out and any player wanting to play will be placed on a team provided they are registered by July 31. At the Empire House level we play in the Empire Amateur Hockey Conference, and they have both White (higher skilled) & Blue (lower skilled) level divisions in most age groups. All evaluation scores are kept completely confidential. Why are Evaluations in April? NYSAHA requires Evaluations not begin until after Nationals. In 2019, Nationals end on 4/8. Travel Tryouts and Spring Break have pushed Evals to 4/24. WHAT IS THE EVALUATION PROCESS? The evaluation process will consist of skill related drills focusing on skating, stopping and puck handling, designed by WYHA and executed by the on-ice staff. The drills are timed by evaluators with the players all competing against the clock. Goalies will participate in a separate Goalie evaluation. Previous years have included a scrimmage which has been replaced by the End of Season Coaches Evaluations as the coaches are in the best position to evaluate your child over a longer time period and multiple games/practices. HOW WILL TEAM PLACEMENT/SELECTIONS BE DETERMINED? After the final evaluation session of each level, the scores will be entered into a spreadsheet. This entry is performed by the Registrar and checked for accuracy by the House Director. The House Director will then determine the preliminary number of teams based on the number of players and scores. The preliminary count of teams will be used to make coach selections and by the ice scheduler for 2019-20 ice planning. WHO WILL HAVE THE PLAYER'S SCORES AND WILL THEY BE MADE PUBLIC? The House Director and Registrar will keep all scores and notes and will use them during the Placement/Selection Process in August. The scores are not made public. WHO WILL BE PRESENT DURING TEAM SELECTIONS? The House Director will create preliminary rosters in early August based on who has registered & paid by July 31, the evaluation scores and the 2018-19 Coach End of Season Player Evaluations. Then the House Director will schedule a Coaches meeting in August to review the preliminary rosters with the Coaches to ensure accuracy and completeness. WHAT IF A PLAYER WANTS TO PLAY GOALIE AND OUT AS A PLAYER? At the RWB and Squirt level, our goal is for all players have the opportunity to play goalie, if desired. However, at the evaluations we will need to see all players skate out for the evaluation process and then goalies will have a separate goalie evaluation. The evaluation process will have the full time goalies to be placed at their evaluated level; however the part-time goalie will be placed as a player and goalie. WHEN WILL ROSTERS BE AVAILABLE? The Final Rosters will be released to the players and families in late August or early September via a phone call or email from the Head Coach. WYHA will also post the team rosters on the website before the first September practices for each team and after coaches make their notifications. How do you know how many teams there will be? After Evals, we look at the numbers who attended Evals plus count any players who paid the deposit but could not attend Evals to determine the numbers of teams at each level so the Ice Scheduler can start planning ice in May & June. If we don't buy enough ice in May, then we may not be able to get more in August once we see who has registered by 7/31 so it is important we have a very close approximation of how many players we will have in April at each level. Do you contact last year's coaches to help determine placement? Yes we use end of season evaluations by coaches and will contact your child's coach if he/she was unable to attend Evals. Obviously attending Evals gives us more data to base the decisions on so we recommend making the Evals if at all possible! When does Registration for 2019-20 Begin? Registration will open in early June and players must be registered and paid (or on a payment plan) by July 31st to be placed on a team. Any player who registers after August 1 will be placed on a team on a space available basis (even if they paid the $150 at April Evals or Tryouts). Why Do I have to pay $150 at Evaluations? #1 This payment gives us some assurance that your child is actually going to register (so our team counts are accurate) #2 Most parents appreciate the opportunity to spread out paying for the hockey fees by paying the first $150 of the fee in April. My child tried out for a WYHA Travel Team and did not Make the Team, do I have to pay another $150? No, just bring your child to Evaluations and tell us at the Registration Desk to transfer the $150 from Travel Tryouts to Empire Evals. Note that Travel Tryouts have an additional $50 fee which pays for the Tryout ice (2-3 hours) and jersey. Evals do NOT have a Fee because players wear their own jersey and they are on the ice for about 45 minutes. When are Teams Announced? Teams will be announced sometime in mid to late August. Our goal is to announce the teams as soon as possible so coaches and parents can plan for the season ahead. What if my child missed Evals due to Illness, Injury or School Event? Register your child for Evals and pay the $150. Also, make sure to register early for the upcoming 2019-2020 season and your player will be placed on a team. Since the accurate placement of your player depends on the evaluators seeing a good sample of skills, your player should attend the scheduled evaluation session. However, we understand that problems can arise, and if your player is unable to attend, please contact the House Director as soon as possible so we are aware of your absence. Coach evaluations will be used or the player may be asked to skate on a team in September for a few sessions before a final determination is made on team placement. When does Empire Season begin? Practices typically begin in September (Red Teams may begin in August) right after school begins. Games start in mid to late October. Please make sure you register by July 31st so we plan for the ice accurately. Beginners should not attend Evaluations. There is no placement needed. Evaluations are Completed, What Happens Next? Week of 4/22: Empire House Evals held. Parents of children who could not attend should complete the registration and pay the $150 so we know to plan for your child. June 1 - June 30: Early registration period. Parents registering their children by June 30 will receive a $50 discount. Also parents using the payment plan should register during June to maximize the benefits of the payment plan. All players on payment plans must be fully paid by 11/30. July 1 - July 31: Regular Registration period. ALL PLAYERS MUST BE REGISTERED BY JULY 31st. After July 31st, a $50 late fee applies and players will only be added to teams on a space available basis. August 1 - 30: Team formation begins using Coach Evals from previous season, registration information, and information collected at Evaluations. Team Jerseys and socks are ordered in early August in order to ensure jerseys are received by late September. It requires a lot of extra coordination to get players who register late (after 8/1) jerseys. Mid August to Labor Day: Players are contacted by the Head Coaches of the team they were drafted onto. Teams may get together to skate, have off ice practices or team functions before Labor Day for team building purposes! September (after Labor Day): Practices begin!